Now that you've created your plan and added some issues for your team, it's time to start thinking about how best to schedule these issues for your team. Issues are typically scheduled by the scheduling algorithm of Portfolio for Jira. The algorithm considers several issue details, to automatically create a sensible timeline of the work that's relevant to you. With the algorithm, it's easier to spot bottlenecks — this gives you a chance to handle these potential problems even before they happen. As handy as the algorithm can be, you don't really see how it works out your schedule. Ultimately, you're only given the resulting schedule. With experience and product knowledge, let's say that you know that an issue should be scheduled earlier than what has been plotted by the algorithm. To get the algorithm to schedule the issue the way it should be scheduled, you'd need to experiment around by changing some issue details. In the new experience, you can now quickly drag and drop the position of an issue in the timeline, to schedule work your way. You’ll no longer have to guess what you should do, to get issue NPE-3 scheduled on 6 November 2018. Scheduling issues is as easy as adding the duration for issues directly in your timeline. Alternatively, you can add target dates for the issues, and these dates will display in the timeline section accordingly. In the timeline section, find the row of the issue you're setting the duration for. Hover on the row until the + icon and duration for the issue appears. Click the row to add in the duration for the issue. Fit: The default duration depends on the date range of the issues in the timeline, which in effect, affects the width of the issues in the timeline. If the width fit is small, then the default duration could perhaps be a week or a month. Custom: The default duration depends on the duration that you set between the start and end dates. If you set a short period of time, then the default duration would be shorter as well. In the roadmap view of your plan, above the timeline section, click Review changes. The 'Review changes' dialog will display, with all changes selected by default. To view multiple changes, expand the corresponding item in the 'What changed' column. With all the checkboxes already selected by default, clear the ones for the changes you do not want to save in Jira. While these changes won't be saved in Jira, these will still exist in your Portfolio plan. Select the checkboxes of the changes you want to save in Jira, then click Save selected changes in Jira. To discard any changes, select the checkboxes of these changes, then click Discard selected changes. These changes will then be discarded from your plan, and the values will revert to the ones currently saved in Jira. In the scope section, find the issue that you're setting target dates for. Set the target startdate and target end date for the issue. This will create a schedule block for the issue in the timeline section. Note that if you set dates for issues that conflict with the dates of their corresponding parent or child issues, you'll explicitly get a warning message for it. This makes it easy for you to quickly fix any dates that may have been mistakenly updated. While scheduling work for your team, we recommend you keep track of the status of the releases in your plan. Click one of the release icons in the timeline section, to view more details about the release. The icons stay green while the release is on track. At any time a release becomes off track, the icon turns red. When a plan is optimized, a release that's off track will also display by how much time it's off track. Make sure to check the details of off track releases so you can fix this accordingly. When you're filtering the issues in your plan using releases, the release icons in your plan will also be filtered. See Viewing work for more details. and the end date would be the latest end date of all its child issues. Drag and drop the schedule block of an issue to its new schedule. Edit the duration of an issue by dragging one of the sides of the schedule block accordingly. Change the target dates of an issue in the fields section. To prioritize work for your teams, you can move an issue to a higher or lower row in the scope section. This moves the position of the issue in both the scope and timeline sections. For instance, in the sample plan below, you can move TIS-119 from issue row #6 to issue row #5. This way, the issues in the plan will have chronological target start dates. In the scope section, when you move an issue that has child issues, the child issues will move with the parent issue. However, moving an individual child issue will only move that child issue. The ranking of child issues is independent of the ranking of their parent issues. If you rank a parent epic higher, the ranking of its child issues in Jira will stay as is. This is helpful, especially if your teams have ranked their issues in their Jira boards — the child issues will retain their ranking as is. Note that when you're planning work in the new experience, you can do both manual planning and optimized planning — it's not meant to be one method or the other. For example, during the early, high-level planning stages, you can start by manually creating and scheduling issues in your timeline. 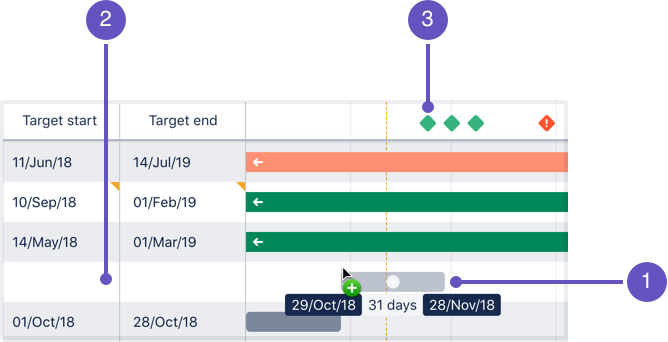 Later on, when your teams start adding more accurate dates and estimates to their work in Jira, you can then optimize your plan, to see if your high-level dates make sense. Above the timeline section of your plan, click Optimize. 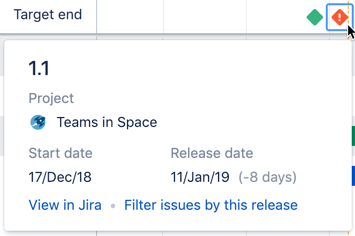 This will display a preview of the optimized changes that Portfolio for Jira is suggesting for your plan. Note that in the timeline section, the schedule blocks of the optimized items will appear in purple stripes. Similarly, in the fields section, the corresponding issue details will also appear in purple stripes, of a lighter shade. Review the optimized changes more closely by hovering on each change, to see the current value saved in Portfolio, and the new value that will be saved in both Portfolio and Jira, if the changes are accepted. In the example above, two (2) values will be optimized, the target start date and target end date. If you accept the optimized changes, the new values will be updated in your plan. To save the optimized changes in your plan, click Accept changes. 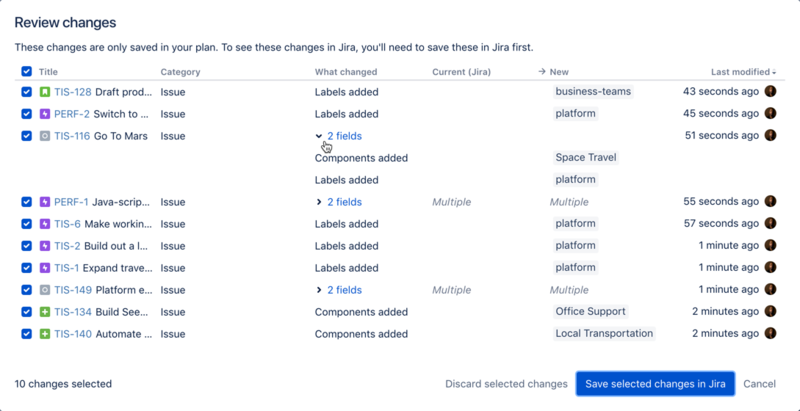 Note that these changes are just saved in your plan, and are not yet saved in Jira. See Saving changes in Jira to know more. To discard the optimized changes, click Cancel. 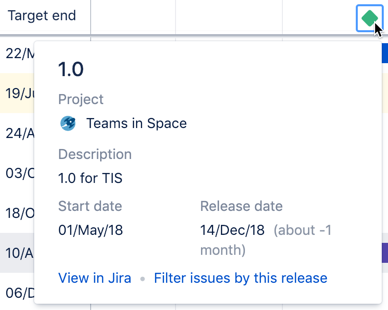 The optimized changes will not be saved in the plan, nor saved in Jira.